Returning in 2019 as the Desert Classic, the 60th anniversary of the valley’s major pro golf tournament will again be a vibrant, spectator-friendly “golf festival,” offering the enhanced fan experience that led to doubling attendance to 60,000 from a year ago, according to tournament officials. Running Jan. 16-20, the tournament features an attractive golf field with tournament ambassador Phil Mickelson and Palm Desert amateur Charlie Reiter. Additionally, there will again be after-golf rock supplied this year by Sammy Hagar and the Circle Jan. 18, and the legendary Bad Company Jan. 19. Outside the tournament grounds, here are some suggestions on how to keep the festival vibe going. Watching the world’s best golfers in-person makes most of us hackers super-eager to hit the links, to try (however unsuccessfully) to channel their ball-striking brilliance and putting mastery. So, if you’re looking to play a round or two yourself while attending the Classic, consider venturing out of the immediate La Quinta neighborhood, for a couple of contrasting takes on desert golf. Home of the memorable “Skins Game” competitions in 1999 to 2002, Terra Lago, with its north and south tracks, is a 10-minute drive east on Interstate 10. The course guarantees you a “desert-y” golfing experience. Hitting the fairways, on either course, is a must as forbidding “natural” areas frequently await. There isn’t a lot of water in play, but, when it does appear, boy is it dramatic. And the same goes for the elevation changes you’ll encounter: they will challenge your club-selecting savvy, but also provide you with stunning desert vistas. Half-an-hour west on Interstate 10, Oak Valley in Beaumont is a parkland track on the Coachella Valley’s fringe. In recent years, it has hosted both the opening and closing tournaments for the Golf Channel Am Tour’s Palm Springs tour. Unlike most of Greater Palm Springs’ more familiar tracks, Oak Valley penalizes errant shots with fairway-lining trees that usually eliminate straight-to-the-green recoveries. And the rough here is some of the toughest around. Walking 18 with your favorite PGA Tour pro works-up an appetite. After you’ve sampled offerings from a pair of popular local eateries in the fan pavilions at the Desert Classic, check out the restaurants themselves. Morgan’s pairs traditional cooking methods with California cuisine sourced with ingredients from the valley. Try the Nottingham Ranch Lamb Saddle or the Wild Mushroom Pappardelle pasta. Adobe Grill brings Mexico to the California desert by way of Oaxacan motif. Try the ahi tuna tostadas, a margarita, and the handmade tamales. At Twenty6, this modern American bistro offers the classics, from buttermilk hotcakes for breakfast to rosemary-roasted chicken dinners. This independent shop has had a loyal local following since it opened in 1981. Comprehensive stock, knowledgeable staff, personable owners (Pete and wife Edna) – those are the basic reasons golfers and tennis players stop by. But the something extra that makes this place unique is the in-store “Jazz for Jazz Lovers” concert series. So if Bad Company isn’t your musical cup of tea after “moving day” at the Desert Classic, head here Jan. 19 for cool modern west coast jazz from the Phil Norman Tentet. 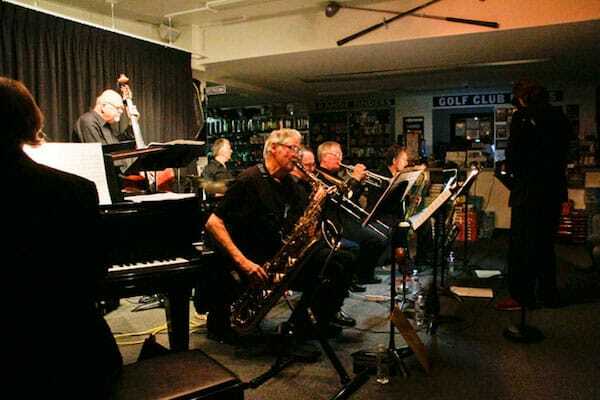 Pete Carlson’s Golf & Tennis Shop converts into a venue for jazz enthusiasts Saturday evenings in January. The pros will be sporting the latest lines from the apparel manufacturers – which may remind you that it’s been awhile since you refreshed your own golf wardrobe. Resist the lure of all those new clubs, balls, and game-improvement gadgets at the front of the store and head straight on through to the shirts, trousers, shoes and outerwear from the likes of Puma, Callaway, adidas, and FootJoy. When you're not busy watching the world's best golfers compete at the CareerBuilder Challenge, take your own game up a notch. Mickelson has won five majors and was champion in the desert in 2002 and ’04. The Jan. 17–21 tournament will be its 59th iteration. For many years, it was played as a 90-hole event, generating most of its extensive charitable donations to Coachella Valley groups through amateur participation. Now, it is a standard PGA Tour event, with 18 holes a day over four days and with a purse of $5.9 million. But the charity element, with a reduced amateur presence, remains intact and lucrative, under John Foster, longtime president of Desert Charities. Entertainment includes Huey Lewis and The News (Jan. 19) and Goo Goo Dolls (Jan. 20). The tournament is traditionally played on a series of courses. This year, CareerBuilder takes over the Stadium Course at PGA West, as well as the Jack Nicklaus Tournament Course at PGA West and the La Quinta Country Club. Defending champion Hudson Swafford will return to defend his only PGA title. Tickets purchased by Jan. 14 will cost $30 for a one-day grounds pass, $75 for a weekly grounds pass, and $25 for a senior one-day pass. Did you know that many Palm Springs area golf and country clubs and gated communities have catchy marketing slogans? I’m not sure who makes these slogans up, but I do find some of them interesting. First Place: My personal favorite is “Once Here, You’ll Know You’ve Arrived." This slogan is used by The Tradition Golf Club in La Quinta. Let’s see, when I arrive in Paris, yep, I know I’m in Paris! Second place goes to the slogan; “Where Distinction Reigns" used by the new home community ofGriffin Ranch in La Quinta. Could it be that the ‘reigns’ was meant to part of the slogan because Griffin Ranch was originally developed as an equestrian community? Reign in those horses! Another Beautiful Day In The Desert. Let's Shoot Some Video! It was another beautiful day in the Palm Springs area today. And while the exciting final round of the Career Builder PGA Tour golf tournament was in process at PGA West in La Quinta, my husband Bill Dettman grabbed his video gear and headed south on Madison Street to Trilogy at La Quinta to shoot new video footage for our Trilogy video tour. You Can View Our New Trilogy Video here. Real estate sales in Trilogy have been very active this season and as of this writing, we have several Trilogy homes under contract for buyer clients. Several more have sold and closed escrow in the past few months. Bill spent about four hours on the Trilogy Golf Course getting the new shots. Then he edited the video footage just this afternoon. For any of you interested in video tech, Bill used a Canon EOS C100 Cinema Camera with an assortment of Canon lenses, a Bright Tangerine Matte Box with a number of special camera filters, a SmallHD HD702 monitor, Manfrotto Carbon Fiber tripod with camera slider and a few other toys. Bill edits his footage in Final Cut Pro X during which time he also selects music tracks which are licensed for our use. For the final step in producing each of our videos, Bill invites me into his editing bay where I record my narration voiceovers. If you enjoy our videos, please let me know and I'll pass this onto Bill.